Angelina Medina was born December 5, 1942, a member of the Bear Clan at Acoma/Zia/Zuni, and has been active in creating stunning works of art from clay since about 1983. Her work, concentrated on hand made polychrome jars, effigy bowls, clay sculptures, as well as jewelry and painting, has earned her a number of prestigious awards throughout the Southwest. 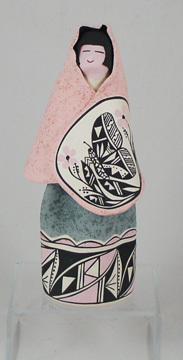 Angelina is also a great teacher who has taught such distinguished potters as Noreen Simplicio and Anderson Peynetsa. 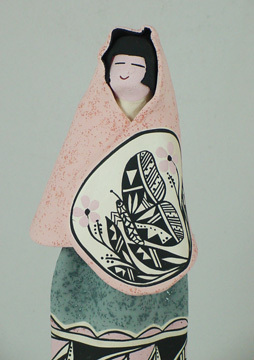 This elegant Mother Earth in Pink Shawl is 10" tall. Her face is deliberately flat to denote she is the spirit of Mother Earth who is so vital to all life. This entity is so very important to all Native people because like any mother she provides and nourishes us in so many ways. The butterfly symbol is obvious to all, I think. In Pueblo villages, there is a Butterfly Dance that is so very beautiful and meaningful that it inspires us to move toward change and transformation to become decent human beings. 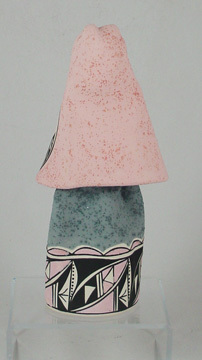 Her skirt is embellished with Aroma pottery designs. I love whom she represents. I believe she'll make a wonderful Mother's Day gift, wedding gift, birthday present, Christmas gift, or she can be placed on a mantel, or altar,etc. Years ago I wondered how I could honor Mother Earth with clay. Obviously I chose to make her into a human/spirit image. She and Father Sun perform miracles all the time. They also show the different kinds of powers they can unleash - positive or negative to humans - at any time. These are to look at ourselves to consider what our human actions have caused or can cause. 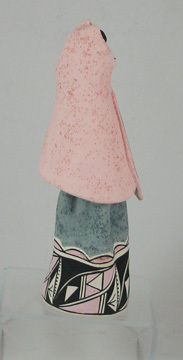 This particular lady is made from natural clay mixed with kaolin. She is totally hand built - no potters wheel or mold is used. After drying, it is sanded. White slip/kaolin is applied to the surface and bottom of the bowl. It is then cloth polished and lastly burnished with a smooth river stone. The design is then outlined freehand, filled in with commercial paint containing glaze, and finally outlined. It is then fired at a high temperature. The bottom has my signature, copyright symbol with my tribe Acoma to identify me as the artist. It is a unique piece and there will never be another exactly like her. If it gets too dusty, run it under tap water and allow it to dry naturally. It'll be fine - no paint will wash away.